You can also have a look at the whole 1905 or at August 11 across the years. Have a look at the old newspapers from 11 August 1905 and get them! Get a FREE Numerology report based on the digits of 11 August 1905! Which were the important events of 11 August 1905 ? Kurt Gerstein: German engineer and mining assessor who became a member of the SS Institute of Hygiene though he still had close links to Christian anti-Nazi Resistance. de Menditte: Amiens Military man. Erwin Chargaff: Austrian-American biochemist and academic (d. 2002). Ernst Jaakson: Estonian diplomat (d. 1998). ...and if 11 August 1905 was your Birth Date then Join our Birthday Club! 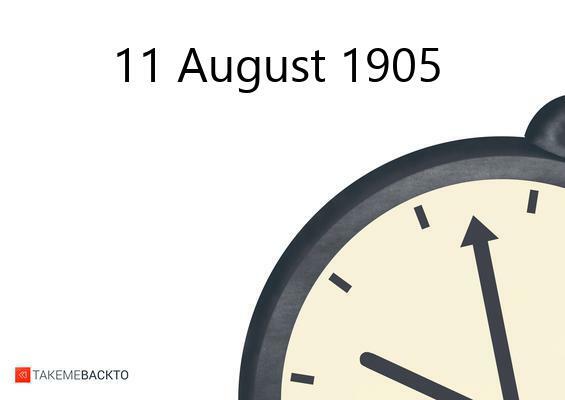 Tell the world why 11 August 1905 is such a special date for you!